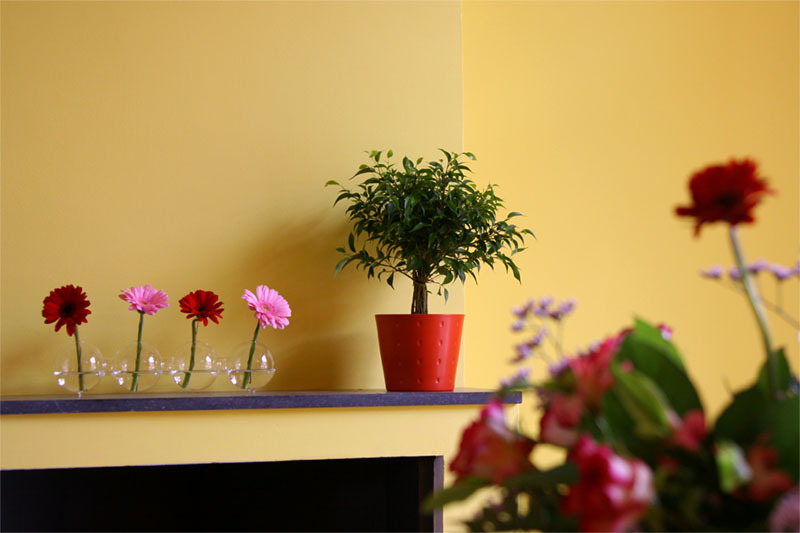 The Yellow Walls love Flowers! Jason Kravitz (Brussels, Belgium) on 27 April 2006 in Art & Design. Leslie sees this photo and it reminds her we need artwork on our walls (photo prints perhaps?!) but I like the simplicity of the walls and the flowers - sharing space. Looks like it's staged ... who's the interior designer in your family? I always want to keep my house like this. But my son never allowed us. I think I should send him to your place. I have another series of the full fireplace and just the orange pot tree which is pretty cool - I'll post one of those at some point too. I was just about to swrite what Suby said..that was the first thing my eye got distracted to. Otherwise its simple and beautiful. Lovely...what equipment do you use? 30d?